"No one would think he'd make such a beautiful corpse." My copy of Dubliners is so old it has eight-five cents printed on the cover—though I can barely read the price, the book is so worn from use. Dubliners is a wonderful collection of stories you can go back to at different times in your life and appreciate on different levels each time. They were written and published before Joyce got sidetracked by his experiments in stream-of-consciousness writing and linguistic gymnastics. It's also before he adopted his theme of poor-little-genius-me—he actually gets inside his characters (who are not himself thinly disguised yet) with great sensitivity. People and situations in Dublin are depicted quite naturalistically. However the stories are not all third-person-objective as might be expected. Joyce shows quite a lyrical bent. The stories are full of poetic sentences like "The cold air stung us and we played till our bodies glowed". The stories are also often inconclusive, sometimes hardly stories with narrative at all, but rather are built around still moments that each reveal in a sudden light an insight into the people or their situations in life. These moments of self-illumination are the nearly mystical "epiphanies", as he called them, that Joyce avidly sought and collected for his later writing. 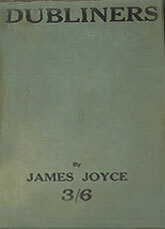 Through the gradual accumulation of stories about the small, seemingly insignificant incidents in the lives of his Irish subjects, Joyce comes to people the broad social network of Dublin at that time. These characters reappear in peripheral roles in his later longer works, A Portrait of the Artist as a Young Man and especially Ulysses. My favourite story in this collection is "The Dead" which concludes the volume on a note of profound sadness when a good-hearted but conventional man discovers the wife he loves had once experienced a tragic passion in her life. The description of him watching the snow fall as she sleeps is heartbreaking in its simplicity. I'd like to quote the entire last beautiful paragraph but it would not be as effective without the story leading up to it. "The Dead" was made into a moving film by director John Huston, the last work of his own life.